Takumi are the master craftsman, and in this case the master craftsmen behind the VR38DETT. Each GT-R engine is handbuilt by one of four Takumi at the Yokohama facility. In Japan those recognized as master craftsmen are known as takumi. At Nissan's factory in Yokohama, only four takumi are sanctioned to put their name on the company's halo vehicle, the legendary GT-R.
Izumi Shioya, Nobumitsu Gozu, Tsunemi Oyama, and leader Takumi Kurosawa -with over 100 years of combined factory experience - these four artisans hand-make the twin-turbo VR38 engines, the pride of the plant and Nissan. Yokohama has produced over 35 million engines in Nissan's near 80-year history, and the small band recognize their historic role and responsibility. "By putting my name on the engine block, I strongly feel I represent Nissan and am regarded as a builder of GT-R engines," says Kurosawa. "I feel a strong pride." Automation is a staple of 21st Century car-making, but in Yokohama's controlled "clean" room, assembly of some 374 engine parts remains a hands-on experience. "We are constantly improving our quality," says Tsunemi Ohyama of his three decades at Nissan. "When GT-R production started in 2007, valve clearance adjustment was by machine, but now everything is by hand - measuring, tightening, measuring again. After manual checks and confirmation, only then do we deliver to our customers." 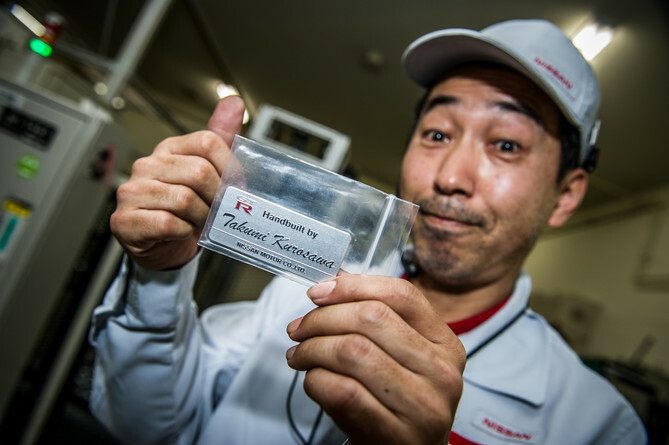 Takumi Kurosawa, whose first name shares the same pronunciation as his team of craftsmen, makes street GT-R engines as well as Super GT300 racing versions. "If you just want to assemble GT-R engines, any skilled person can learn in three to four months, but GT-Rs are used for shopping or to drive at speeds of 320 km per hour on a racing circuit, so exact precision for each engine part is required." "Takumi are responsible not only for engine assembly but also judging part quality and guaranteeing precision. 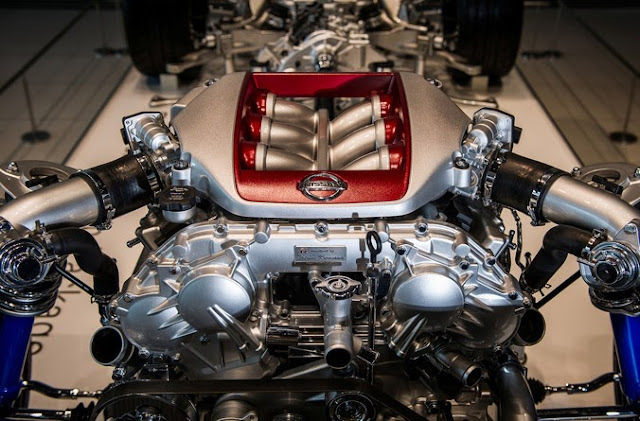 Each GT-R engine is hand-made by a single craftsman - that's the difference from other engines." The 3.8-liter engine, producing 545 hp, faces extensive testing on site, finally receiving the literal bond between its builder and owner. After the up to 6-hour assembly, takumi place their own named seal on the engine block, a pledge of quality as well as kansei, consideration of its use ahead. "The GT-R owner has a special feeling towards their car, " says GT-R builder and owner Nobumitsu Gozu. "Although it's an older model, I also own a GT-R, so I understand the feelings of GT-R customers, and we put our souls into each engine, hoping to deliver that excitement to customers." Izumi Shioya has built many engines in his two decades, but still aims for perfection. "What I consider a 'perfect engine' is one that I am convinced will have the highest performance," Shioya says. Making supercar engines is only part of the story, as Yokohama plant chief Nobuhiro Ozawa says owners want to meet their GT-R's builder. "We sometimes receive comments from GT-R owners such as 'Who built this engine?' Some even come to the Yokohama plant wishing to meet the actual engine-maker. When they met, he said, 'Thank you for building my GT-R engine," says Ozawa. The paper namecards of takumi do not mention their status among the world's great motor craftsmen, but an ultimate honor comes when their handiwork rolls down the line, with a small nameplate attached and the engine soon to be placed inside the GT-R, forging a seal of craftsmanship for the ages. What's in a name? For the builders of a Nissan GT-R engine, everything. Meet the Yokohama the four master craftsmen, takumi, who hand-build the supercar's engines: Takumi Kurosawa, Tsunemi Oyama, Izymi Shioya, and Nobumitsu Gozu.